I recently had the pleasure of attending a week-long workshop at a Retreat Center off the coast of Connecticut called Enders Island. The course was taught by Tatiana Berestova and Dmitrii Berestov, professional iconographers and teachers of the Prosopon School (Просопон) in New York. This was an extremely satisfying, and sometimes frustrating week, where fourteen students gathered to learn the process of icon writing. In iconography the process is called writing, never ‘painting’. We had a wonderful group of people, both the students and the instructors. We thoroughly enjoyed our time together, we broke bread, prayed, and completed our icons, all together! I arrived at Mystic by train and proceeded to Enders by Taxi. I met the instructors almost right away as well as other students. I was happy to be able to use my Russian a bit during the week. 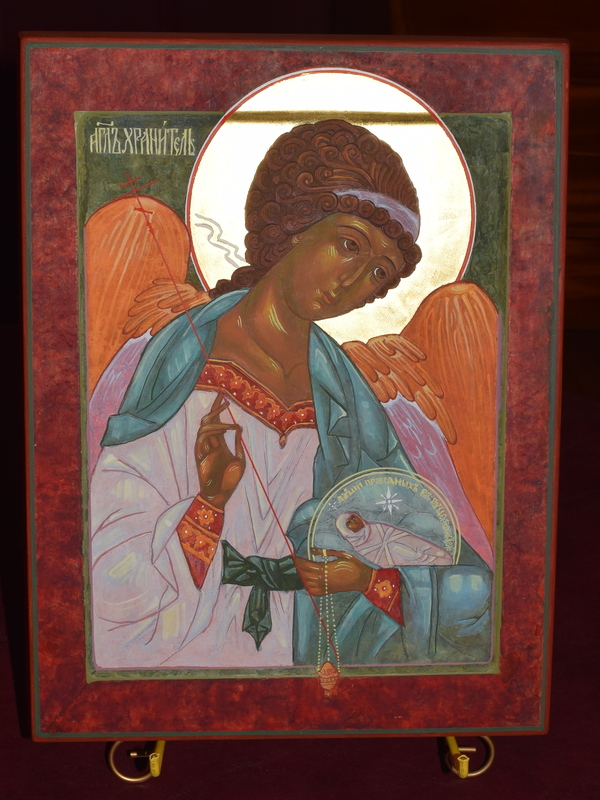 At the evening gathering on the first day we agreed that, with one exception, we’d all work on the icon of the Guardian Angel. The first day of class was actually on my birthday, and what a birthday present to myself it was! Each day began with having breakfast together in the dining hall and then proceeding to the Studio, next to the chapel. Classes actually began after the 9:00am daily Mass, which was a nice opportunity to be able to actually attend daily Mass. On the first day, at the end of Mass all of the icon students received the “blessing” of hands from the priest. This is the first prerequisite before attempting the process of icon writing. The week included much theological lecture and discussion in order to better understand the sacred task that we were undertaking. The first day was very full, theology lecture, transfer of the image to the board (рисунок), then the engraving (графья), the application of clay (глина), then burnishing the clay. After that the gold leafing (золочение) of the halo. This all took from 10:00am until about 8:30pm, with time for lunch and dinner of course. The food was excellent, indeed! Here are some photos from the week, after which I’ll write more detail about the ensuing days. There are many steps and considerable vocabulary to both know and understand in order to write an icon. We actually started at rung 4 on the ladder, beginning with prepared boards. The reason for this is that the boards alone would take at least 3 days to prepare. Each day’s class begins with the recitation of the icon-writer’s prayer, a very important ‘step’ to getting into the correct frame of mind before beginning this sacred work. By the end of day two we had climbed rung 9 (Roskrysh’) and partly rung 10 (First Lines). Day 3, interestingly, was the Feast of St. Charles Borromeo (patron of my home parish)! We began, after the prayer of course, with the meditation of the concept of Light and Life, then a discussion of the meaning of Roskrysh’ (Роскрышь), which means the revealing or opening. Icon writing begins with what you would think of as dark colors, adding successively lighter layers. Eventually the light is revealed and opened up and the bright white of the gesso layer illuminates the icon. Look at the Gallery between pictures of “Halo, Red Crown, Sankir” and the “Completed Guardian Angel” to see what this means. By the end of day three we finished climbing rung 10 and then rung 11 (First Light). This took the entire day, all the way up until 9:00pm. In addition to the theology, there was of course much discussion about mixing of pigments and learning about colors and paints. But fortunately our instructor Dmitrii ground all of the pigments and mixed all of the colors for us. This is certainly not something for the first time student. It is, in fact, an art unto itself. Only natural pigments are used and the entire icon is written with egg tempera, which is a fascinating and very long lasting medium. By the fourth day we climbed rung 12 and were well onto rung 13 by evening. I took charge of the studio key for the next couple of morning in order to open early for those wishing to get an early start, or to catch up! On the fifth day there was much more “light” appearing! We worked through the 2nd light and 2nd float, 3rd light and 3rd float, climbing rungs 13, 14, 15, 16 and onto rung 17, first half of the final drawing. More lines, face, hands, etc. Staff (cross), which had to be done early in the morning in order to be dry. I was able to complete the staff in red, using a rule pen filled with paint. As Dmitrii said many times, “do not hesitate”. Once you begin to draw with the rule pen, you cannot pause or be timid, even for a second lest you end up with a blob of paint in the middle of the line. And a blob of bright red would be very bad indeed at this point! This “emblem” represents many things, perhaps it will be discussed further in another blog posting! Suffice to say that is represents “The King of Glory, Jesus Christ, Son of God. 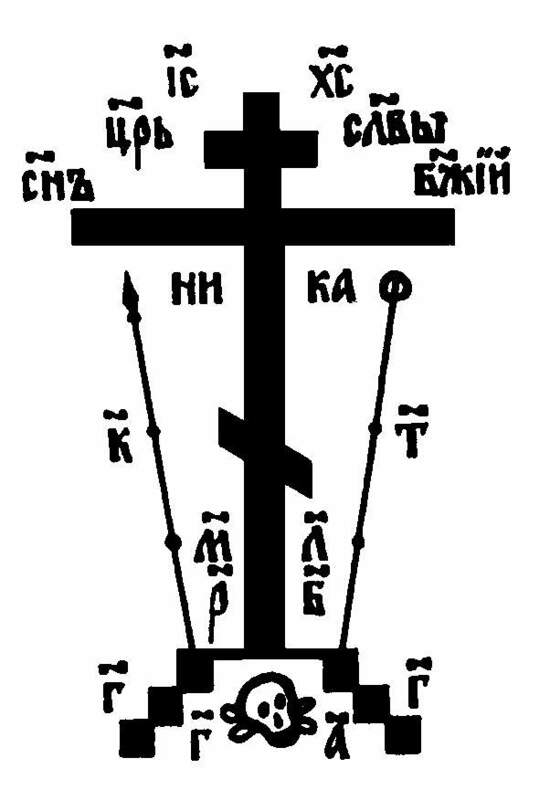 and that the Place of the Skull (Golgotha) will be where Paradise is found”. The final lines were put into place on the icon and after “many” inspections by Tatiana, then tweaks and fixes, the icon was completed and we ended on rung 19, just in time for dinner! The only remaining steps are to oil the icon (olifa) for preservation/protection (rung 20), then after an appropriate drying period it will be taken to church for the liturgical consecration (rung 21) and finally I’ll be able to enjoy it in contemplation (rung 22). What a journey. I truly hope I’ll be able to take this journey again next year! A better picture, at least until the Olifa (oil) is put on! This entry was posted in iconography and tagged iconography, iconology. Bookmark the permalink.